Ever find yourself saying, "Well THAT would've been good to know before I __FILL IN THE BLANK__"? Even though I did a ton of research first, I would've done things differently if only I'd known these eight things. Seriously. Think about it. You either buy it or build it. You will spend hundreds of dollars on either premade equipment or on tools just to get started. If you don't mind the risk of AFB (the cure for which is burning down the hive) then by all means, pick up a used hive. I opted to start with brand new. The Warré hive pictured is a prebuilt (kaching) windowed (kaching) hive, accessorized (kaching) with an extra hive body. Most starter kits are 2-boxes, which is simply not big enough for a full-sized colony. Other items we purchased include a propolis screen and hive top feeder. Then polyurethane to make the feeder usable. Then special glue to repair the leaking feeder because (apparently) we didn't apply enough urethane. With veils, gloves, hive tool and a smoker, the total came to about $500 without any bees. Our first occupants were from a swarm that issued from our Top Bar Hive so they were free. But the colony had to be coddled through their first winter, which meant building a feeder rim (a borrowed table saw and that $11 bottle of glue came in handy), making fondant and buying pollen patties. We're up to $575 now. The little colony made it into Spring and quadrupled. By quadrupled, I mean the colony swarmed three times, and unfortunately none of the colonies made it through the year. Before kicking the bucket, though, they had a good honey-making season so we bought a cheese cutting wire to separate boxes in order to insert our vortex escape (built not bought), and some super cute honey jars (kaching!). The whole family got honey and one jar even shipped out of state to win a honey tasting contest. 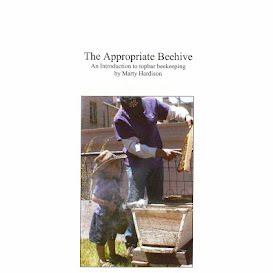 At the end that year of beekeeping, we'd spent over $600 yet again had no bees. I hope the family realizes that the honey I sent them cost me about $25 each. A package of bees to get started again runs about $125 so, amortized, a second honey crop works out to about $18/lb. Better, but I pay less than that for grass-fed beef. I've got the rest of winter to, as Pooh would say, "Think. Think. Think," about ways to restart on-the-cheap. Until then, I need to find a place to store all my beekeeping stuff. Which brings me to #2 on the list, Beekeeping takes up a lot of space.